LPA recognized that earlier cohorts of immigrant youth who had adjusted well to life in the Philadelphia region were valuable resources in LPA’s efforts to reach out and engage the more newly-arrived youth in the region. 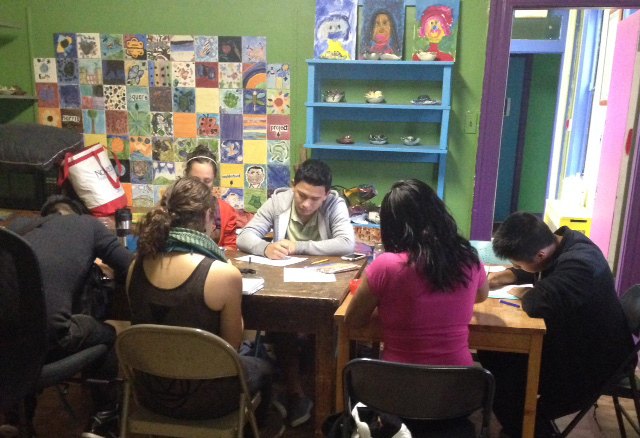 Following the “promotora” model of community outreach workers as a mechanism for engaging individuals who are typically on the margins of society, a pilot program called Compas de Viaje (Buddies of the Journey/Compass for the Journey) was implemented in 2015 with a small group of mixed-gender immigrant youth who have made the commitment to learn peer mentorship and outreach to immigrant peers who are new to the community. The Compas peer mentors receive individual supervision from the clinical staff at LPA and intensive group training in skills like conscientious communication, relationship-building and inter-personal safety and boundaries. Presentations developed and led by trained Compas mentors for educators, community groups, and other service venues relating to the experiences and needs of immigrant youth! La Puerta Abierta/The Open Door is a great organization that has helped a lot of kids like me. To me personally, La Puerta Abierta has been one of the main basis in my successful life as a student and has also helped me to overcome bad experiences that I have passed through by giving me their unconditional emotional, and mental support.I believe that La Puerta Abierta has made a big change in my life by helping me understand that as in this country are people who will judge us because of what they hear about us there are also people that understand our issues and have a good heart to help us. Emotional support means a lot to us when we are new in the country and I truly believe that their emotional support has helped me to feel comfortable in this country and live without fears. I hope that this organization will never stop doing the great job they do and I will always be happy to support them in any way possible because they are people who made me think in a different way. Not only me, I am sure that there are more kids who are also happy and grateful that they have found a great organization as La Puerta Abierta/ The Open Door.